grandmasgenesblog – We are into Genes and Genealogy – now get your Grandma some Blueberry Pie! Please continue to follow your Grandma’s Posts…follow the blog on Greandma’s Genes Website. It’s is where all new posts are. Roberta Estes Blog about the better Family Tree views at Family Tree DNA. Thanks Roberta! It’s great when a vendor listens to what I’m sure probably wasn’t perceived as constructive criticism. Family Tree DNA designed a new tree some time back, but with only a Family View. 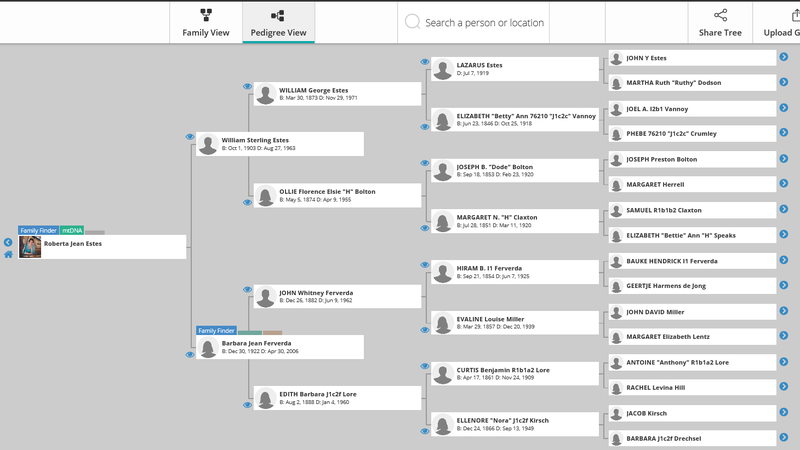 Most genealogists utilize the Pedigree View, shown above, most often. A few months ago, genetic genealogists asked Family Tree DNA to redesign the tree and include a pedigree view. Today, the new tree view was added to everyone’s personal page! The pedigree view is relevant for direct line ancestors. This screen shot is of my own tree, but this view works for any of your matches who have trees attached as well. You can see 4 generations of ancestors at once and click to expand to the next 4 generations with the right arrow at any end-of-line ancestor. You can also scroll or click to make the tree larger or smaller. Author grandmasgenesblogPosted on July 7, 2016 July 8, 2016 Categories DNA, Genealogy, Genetic GenealogyLeave a comment on I Am So Sorry Dad – We’re Pending. Author grandmasgenesblogPosted on June 21, 2016 June 21, 2016 Categories Cluster Genealogy, CWTags Cluster GenealogyLeave a comment on Cluster Genealogy Part 3 – I have Maine on My Wall. My subject? Why it’s “WikiTree and Family Search, Oh, The Connections You’ll Make!”. There are all sorts of Wiki based projects “out there”. WikiPedia is probably the best known, WikiAnswers, and others of all kinds. (There’s even a Wiki to search all of the various Wiki’s!) The Family Search Site even has it’s own Wiki – FamilySearch Wiki. This wiki is chock full of great information on everything Genealogy. The Wiki I am talking about is my favorite Wiki, WikiTree. Wikitree is a Global family Tree. It is one single tree built by volunteers from all over the world. It is a free Genealogy site which is my Genealogy program of choice. I have used a few programs in the past and they were pretty static. Static, meaning they didn’t move. They didn’t do anything from my computer…well one did, it uploaded all of my hard work to a “pay-for” Genealogy site. At the time I didn’t mind. At the time I knew I would never upgrade my “free” membership to a paid membership because I don’t believe in it. I, no one, should have to pay to see my/our ancestors. WikiTree is the converse of static. It changes and grows and expands like a real live tree. I have made more real live cousin connections in the two plus years I have been a part of Wikitree than in the 18 years I have done Genealogy. That being said, WikiTree offers the opportunity to make connections. Making connections in Genealogy is important because connecting allows others who have the same interests as you, and you, to share information, sources, pictures and memories. It’s model of collaboration is an experiment in old school Genealogy, gone wrong/wrong way of thinking. Different in that you collaborate and share first – as you work. Done in discussions with other researchers, family historians and genealogists…then just sit back and watch your research move forward, facilitated by WikiTree. In WikiTree you can post your research AND have others collaborate on the research. Then with one click connect that research to other, existing FamilySearch profiles. One click and you are shown possible matches on Family Search. Wikitree saves that information on the WikiTree profile too. So you have a link straight to Family search for the profile you are researching on WikiTree. Pretty darn spiffy! More on this tomorrow at the conference. Come see me…maybe I will have some blueberry pie waiting for you. The presentation slides are available. I know I am the only one who does this. I am the only genealogist who has a sense of family, who feels an ancestor’s pain when I type a date into my Genealogy program of choice (WikiTree). I am the only one who, when reading about some horrific event in an ancestors life, feel it in the pit of my stomach. I am the only one who feels pride when I read that someone was mentioned in the hallowed halls of Congress upon her death. I know I am the only one. Today I was working on an adoptee client’s mirror family tree (a tree created to “mirror” the tree of a DNA match, using the match as the “home” person). The husband of the probable mother of the adoptee shares as his death date, a birthday with my Grandfather. As I hit each key to type the death date, I realized that I didn’t just notice when someone shares my birthday, but I notice when I type any of my other important birthdays too. I have a lot of those dates floating around in my brain. I even use the birth dates to switch around the combinations for my bicycle lock. Having the best bicycle in the house, I have had to change my combo’s a lot because certain children (child) in my life liked to borrow my bike lock or even attempt to borrow my bike. BAD CHILDREN! Right now my bike lock is so far back in my history and brain that it took me weeks and weeks to figure it out – Thank you Ross and several others in my life who share your birthday. I count stairs when I climb them too. Ask me about all telephone numbers I have had in my life…I know, too much information. Noticing significant dates and feeling each keystroke. I am the only one who feels it. The date I typed just a few minutes ago might be even more significant to the Client. It might be the date of her mother or father’s or grandparents death – probably Grandparent. Just to think I am looking at the people that this adoptee has wondered about/looked for, for over 80 years. 80 years of dates come and gone, of weddings and births, graduations and vacations, thanksgivings and deaths. All of them in my finger tips, transferred to the keyboard and out into the ether. I am on pins and needles waiting for the final DNA test. There have been many tests done for her birth family. Why? Because, this client’s birth family has a rabid family-historian/genealogist in its limbs, thank you universe. This family historian has been on the trail of another adoptee from the family for a while. There are generational differences, but this adoptee is my clients’ closest living relative. No she isn’t the other adoptee’s mother. And there is a skew in the match numbers for the two. They are first cousins once removed kinda sorta. Not exactly a first cousin, certainly not an Aunt and niece. But…it’s so hard to put your finger on because there was endogamy (the custom of marrying only within the limits of a local community, clan, or tribe – WikiPedia) in the family, for generations and generations. My fingertips are stinging from all this typing. I, personally, feel the sting too. So, surely, there are no other genealogist out there in the world who do this, who feel every keystroke, or feel in the input of every recognizable date. Author grandmasgenesblogPosted on June 10, 2016 June 10, 2016 Categories Genetic GenealogyLeave a comment on I know I am the only one who does this.